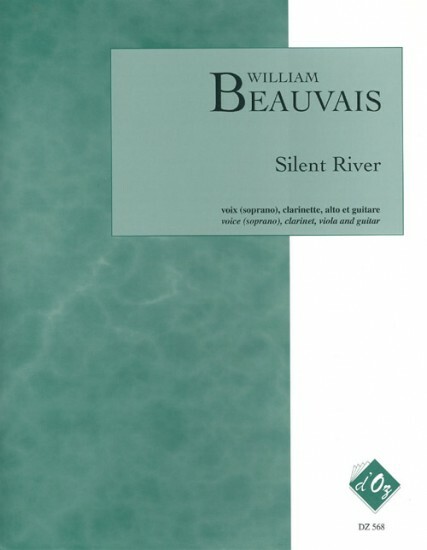 William Beauvais, who is based in Canada, composed not only the music, but inspired by a poem by Kahil Gibran, has also written the text. The words stress the transitory nature of life and describe how all things are in the process of becoming something else. The guitar part is grade four standard and above, with flowing phrases, sometimes repetitive, that lies easily under the fingers despite three flats. The guitar does not play continually but chips in with musical comments once in a while. When an instrument has nothing to say it stays quiet and the focus moves to another. The composer frequently pairs the clarinet and viola playing a pattern in a phrase one beat apart. The melodic pattern in these sections uses three whole tones representing a stasis over which the voice can soar. The clarinet and viola parts are interlinked but the guitar and soprano weave in and out. The music is attractively presented, with separate parts for each instrument. The musical lines are shared out fairly evenly betweens the instruments, which is an important consideration when choosing an ensemble piece. As there is always a demand for different combinations of instruments at an intermediate level, this is a composition that is likely to be taken up and put to use.